Price includes frame, graphics, case graphic, case and pronto monitor mount. - *Screen not included. 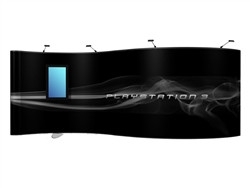 Enhance your pop up display with the magic of dynamic digital content! This eye-catching serpentine display includes our exclusive Pronto Monitor Mount to hang screens up to 42". Perfect to create a presentation area to showcase your latest products or services to your clients. This kit comes with everything you will need to make a splash at your next show: bright graphic panels, light-weight aluminum frame, halogen lamps, Pronto mount with a stabilizing feet, and hard shipping case with wheels!